Our new CFD hardware has enabled us to use a much more accurate mesh, this change resulted in a 5% performance increase of our GT aero kit. The mesh could clearly be refined further since the result did vary. The variations were not that big though, so we can safely assume that the main flow pattern is correctly resolved. We'll continue developing the GT's body kit quite reassured that the results give a reasonably accurate indication of whether we're going in the right direction or not. 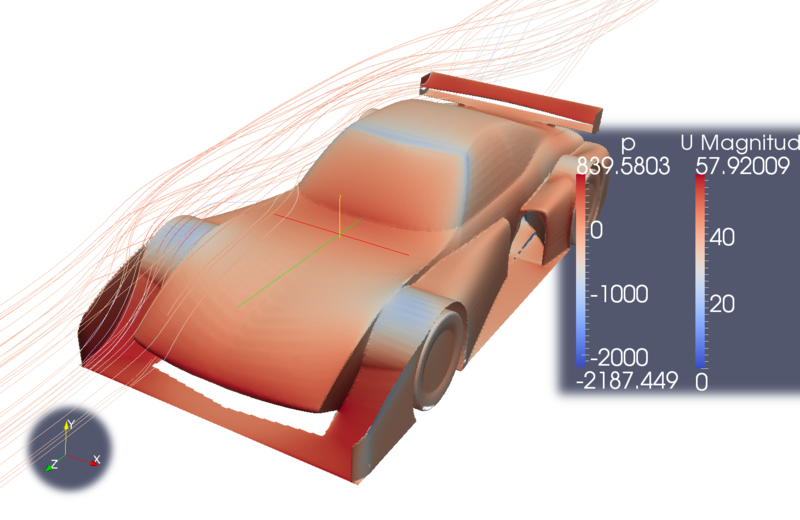 After some small shape optimization and a extra wing profile at the rear end our latest CFD results are now 3994N downforce for 1025N drag at 144km/h. Our effective pressure point is slightly off from our target, though. We need more downforce at the front. Working on the front end was our next attention point anyway, so hopefully we'll arrive at optimum downforce at just the right pressure point so that as little compromise as possible is needed to get the correct aero-balance. The GT has progressed a few versions. We already ended up in one improvement dead-end, but after testing with a skirt equipped model (that blocks airflow under the sides of the car) we found the limiting factor in the model and have got some further gains. The local tracks here in Finland are very slow, which helps speed up the design. Downforce is the dominant performance value, and virtually no notice needs to be given to drag values. 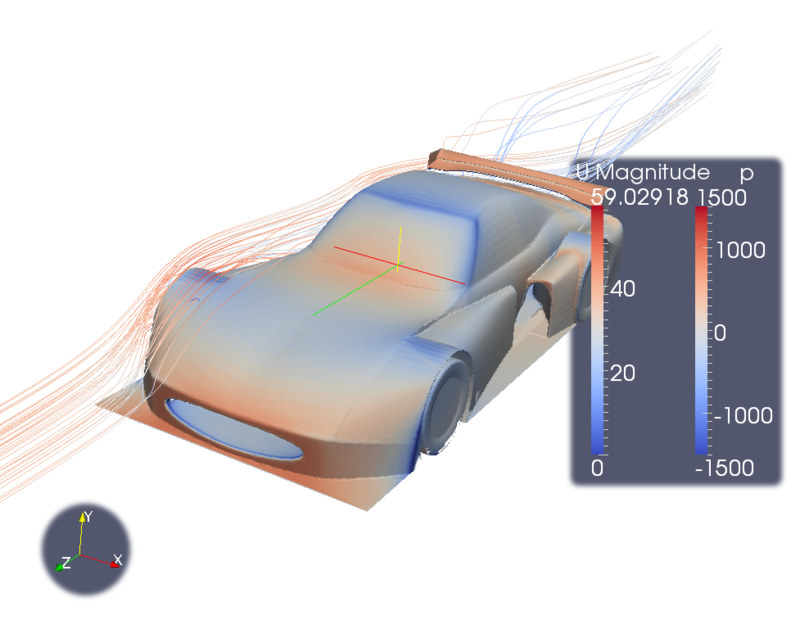 Our most recent model showed 3438N downforce with 1038N drag at 144km/h. With a light car this downforce amount increases performance dramatically. The most noticeable change to the car design is the front-end's "air dam" type. We'll probably fine tune this to optimize the under-body airflow. The largest amount of time has been spent on the diffuser and floor shape. We slightly reduced the diffuser angle and added vertical streaks to prevent unwanted vortices. We found a problem in the computation model and fixed it. In addition we made some changes to the front, diffuser and the rear wing of the car. Some small changes were made to other parts as well. The rear wing was changed to a multi-profile design, the profile was also changed and the angle of attack modified. The angle of attack is also variable. With these changes the entire wing works optimally and produces more downforce. The newest calculation converged to 3270N downforce and 1022N drag. Compared to Le Mans prototypes from the 90's these values are slightly worse, but the stock car frame we are using is limiting the design. There should be some room for improvement though. We've used about 40 hours so far designing the CAD model, and about 10 hours running the CFD calculations. 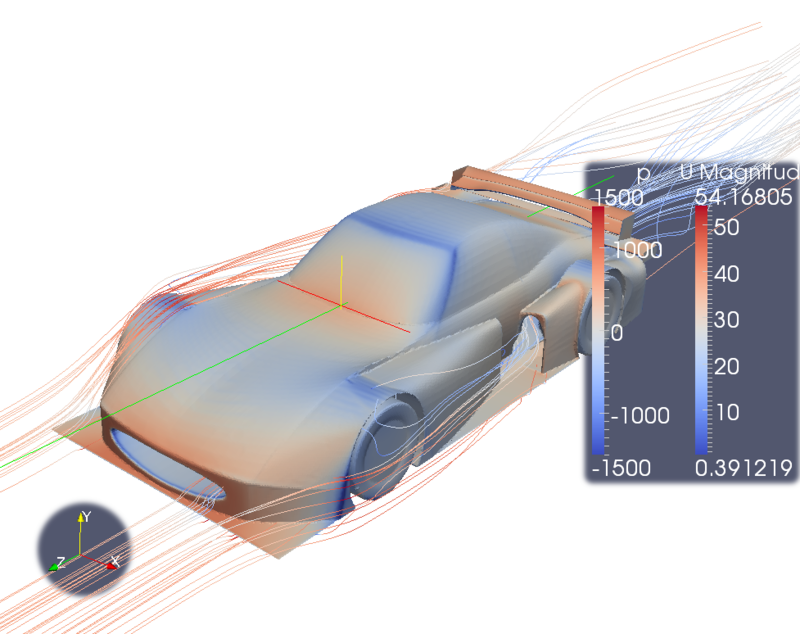 We're currently performing flow simulation on the Opel GT. In the picture below is the second version of the aerokit and you can see the pressure distribution and the flow speed. The current values are 3009N downforce and 952N drag at 144km/h. For the simulation we are using OpenFOAM.